It takes just minutes to scrub these carrots, slice them in half and brush them with a wonderful concoction of whole-grain mustard, olive oil and golden balsamic vinegar. 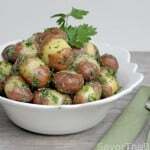 Pop them into the oven for a short roast and serve with a sprinkling of fresh dill. Perfection! I can remember well, my dad planting carrots in our annual garden and how my sister and I would sneak out there after school and have a little snack crunching of freshly pulled carrots after washing them at the garden hose. Also, the big red radishes. Have you ever ate a radish sandwich? It was made from Wonder bread slathered with mayonnaise and sliced freshly pulled radishes. 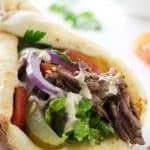 Oh, the things my parents would eat! 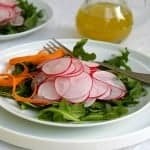 I still love crunching on raw carrots and radishes! 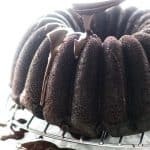 It is curious what memories are conjured up over certain foods. According to my Flavor Bible, carrots and dill are related and in this recipe they compliment each other beautifully! Roasting the carrots brings out their natural sweetness while the balsamic vinegar adds just a smidgen of acidity to their sweetness. We used the golden balsamic variety of balsamic vinegar for this recipe which allows the carrots to retain their vivid color. If you don’t have golden balsamic vinegar I would recommend using traditional red balsamic vinegar as a substitute. Balsamic vinegar has a unique sweetness and lovely aromatics that make this recipe so tantalizing. If you were to substitute with a regular white vinegar, you would miss out on that complex flavor that only balsamic vinegar can bring. 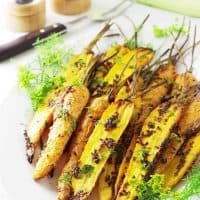 There are so many ways to enjoy this wonderful root vegetable but this mustard-dill roasted carrot recipe has got to be one of my favorites. 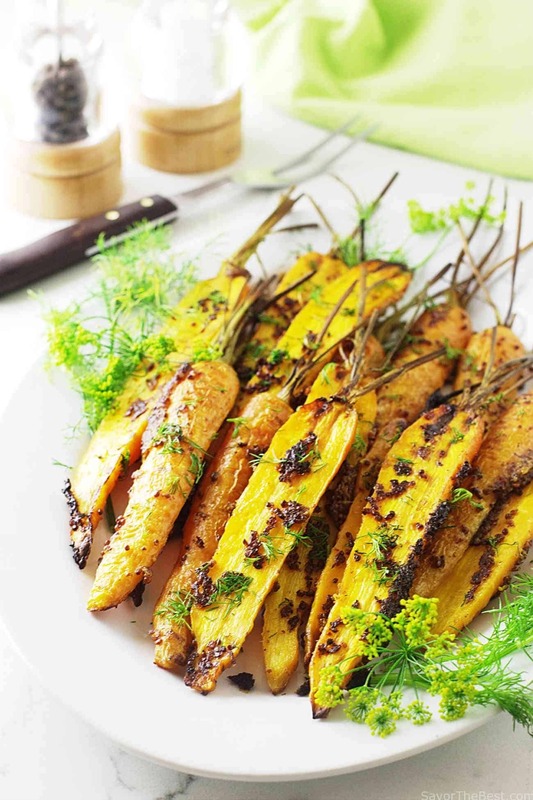 Oven roasted mustard-dill carrots are brushed with a mix of whole-grain mustard, olive oil and golden balsamic vinegar then sprinkled with fresh dill. 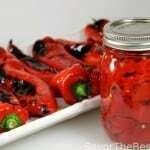 This is a very easy side dish recipe to add at any time. In a small dish, whisk together the olive oil, mustard and vinegar. Set aside. Wash the carrots under cold water scrubbing off any soil, trim the top to 2-inches and remove any long-tailed roots. Peel with a vegetable peeler if desired. If the carrots are scrubbed well there is no need to peel them. Slice each carrot in half lengthwise. Brush the mustard mixture on both sides of the carrots and place them cut side down on the prepared baking sheet. Sprinkle the carrots with the salt and grind the pepper on them. 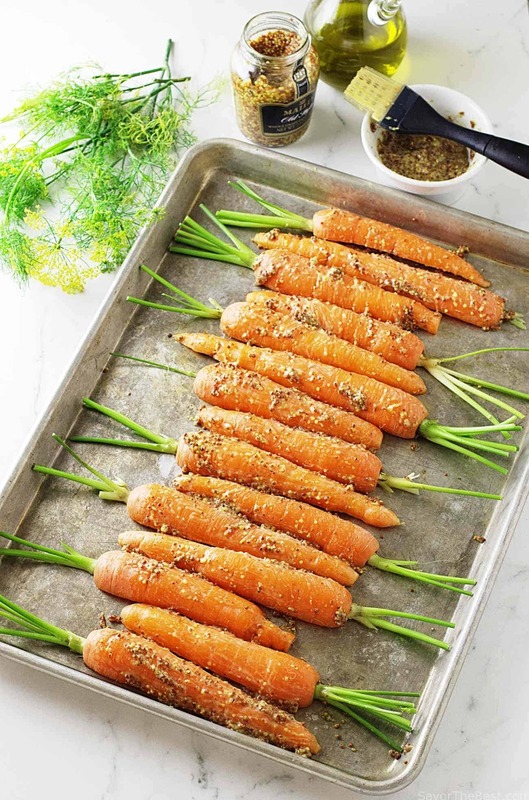 Transfer the sheet pan to the oven and roast the carrots for 25-30 minutes, until they are just tender when pierced with a fork at the top of a carrot. Remove from the oven and transfer to a serving dish. Sprinkle the chopped dill over the top and garnish with dill sprigs. 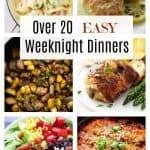 I have a pack of colorful carrots in my fridge and was looking for some recipe inspiration when I stumbled upon your recipe. 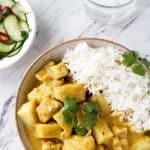 Now I know what I’m making for lunch tomorrow! Ooh mustard. Roasted carrots are fabulous, but I’ve never paired them with mustard before. Will have to try. I’ve just discovered your site and as a fellow enthusiast for older grains, I’m quite excited. Hi, Choclette: I am so happy you found our site. The mustard and dill are great taste enhancers with our carrots. I’m thinking that you will love them! 🙂 I hope you enjoy the ancient grain recipes as well. never ever will I say carrots are boring!! not after seeing this recipe!!! oh my goodness, the color on these is amazing. I bet they taste as good as they look too. 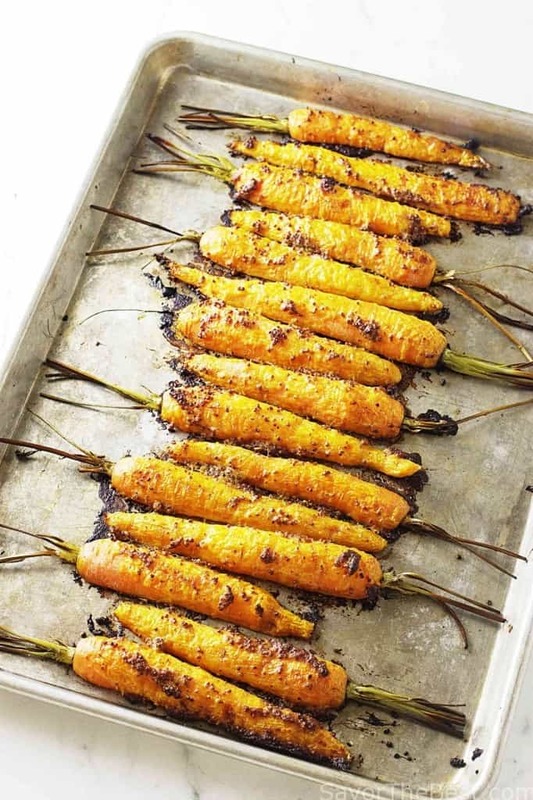 Roasting carrots is so underrated – they are so delicious that way! Wow these carrots look sooo pretty!! Healthy and full of flavor, right along I want my side to be! Such a great way to prepare carrots! I love that color and the flavors sound amazing. And ps….I’d totally eat these carrots for breakfast! ? 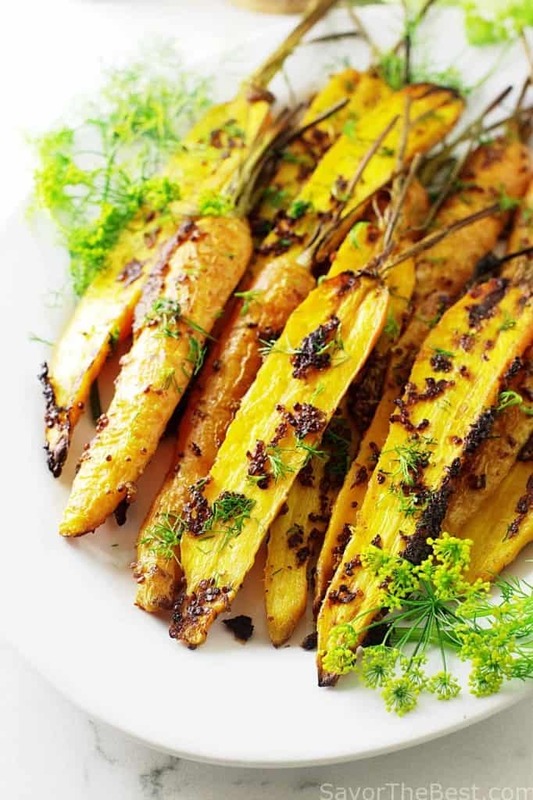 Roasted carrots are so good…it brings out the sweetness and I love the mustard and balsamic you used…yum! When I was a kid we ate radish sandwiches on plain white bread with butter or cottage cheese! We looked forward to them every year when the radishes were finally ready to pull from the garden! I bet these carrots are full of flavour with the mustard and dill, they look amazing too. I love how you have roasted these whole with the stems poking out the top. They look and sound fantastic! WOW these are stunning! Mustard and carrots would be a great pairing. Thanks for sharing! Thanks for the comments, Bri! 🙂 This is a great and simple side dish. I love your pictures of the carrots! They look so pretty and fresh. I didn’t know that dill and carrots were related, but it makes sense now that I think about it. Definitely making this this weekend! These look amazing!